Dale twins on a deep level with fellow only child, comedian, and performer Addie Weyrich. Exactly like Dale in every way, Addie grew up in Philadelphia, gave it her all running track, and has a long-standing fear of the Amish. Addie reveals a great deal on this episode, tracing her journey from teen acting classes to landing a role on HBO’s Crashing. She includes one Deep Night revelation that even her parents didn’t know about! Sorry you had to find out this way, folks! 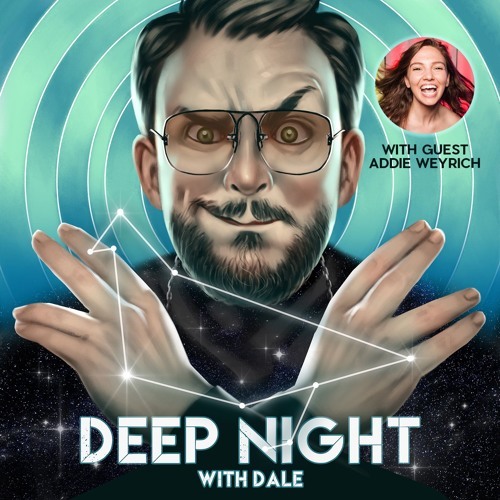 Addie’s story of overcoming a terrible situation is an inspiration, and the fact that she found a supportive network in comedy gives Dale hope that someday he may find his own community (something other than the fellas at the turtleneck swaps down by the piers). Plus Addie explains to Dale how Ultimate Frisbee can be a powerful tool for personal growth. All this and a conversation about that Gritty character and Dale’s own troubled history as a creature-based mascot.